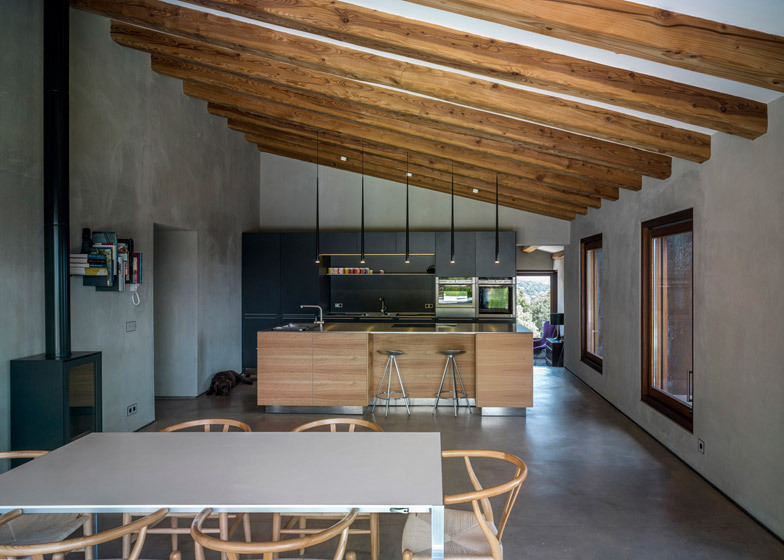 Rusted steel frames project from the traditional stone and plaster walls of this renovated farm house in Spain's Gavarres mountains by Barcelona office Zest Architecture. 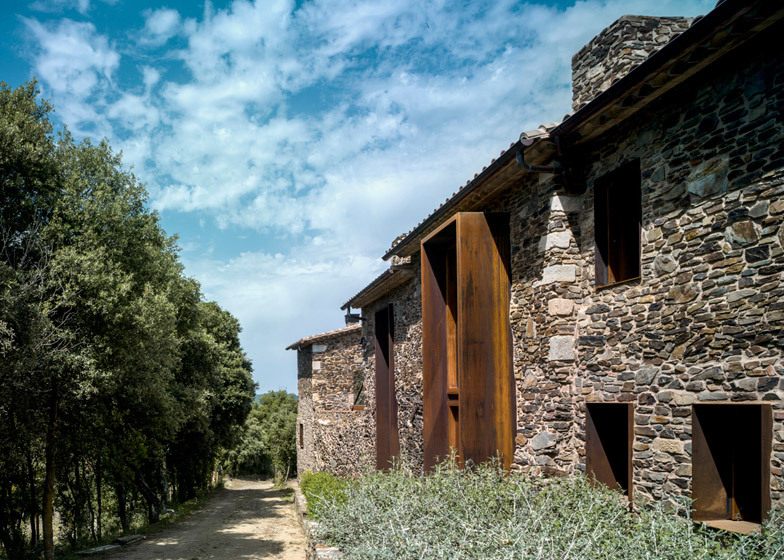 The homeowners were granted permission to renovate an existing ruined farmhouse on a site surrounded by a forest with views towards the Mediterranean Sea, and endeavoured to rebuild the stone structure. Planning regulations dictated that the new building should assume the same dimensions and appearance as the original, but Zest Architecture was able to introduce contemporary details including Corten steel surfaces around the windows and doors. "Our work aimed to create a modern, luxury estate in an old stone envelope," the architects explained. "We opened the house up on all sides, letting the light flood in and bringing the view inside." 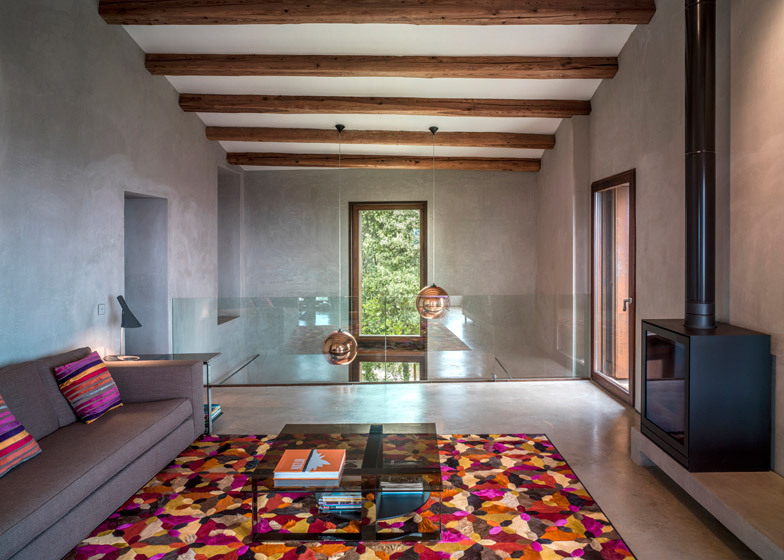 Named Villa CP, the building is situated on a steeply sloping hillside and is connected to the garden on several levels by a series of external staircases. In the original farmhouse the ground floor would have kept animals and the farmers would have lived upstairs. The architects reimagined this arrangement, creating bedrooms on the lower floor and living areas above. This configuration allows the bedrooms to stay cool in summer and ensures the living, dining and kitchen areas feature the best views. Windows slide into the wall to offer unobstructed views towards the horizon. 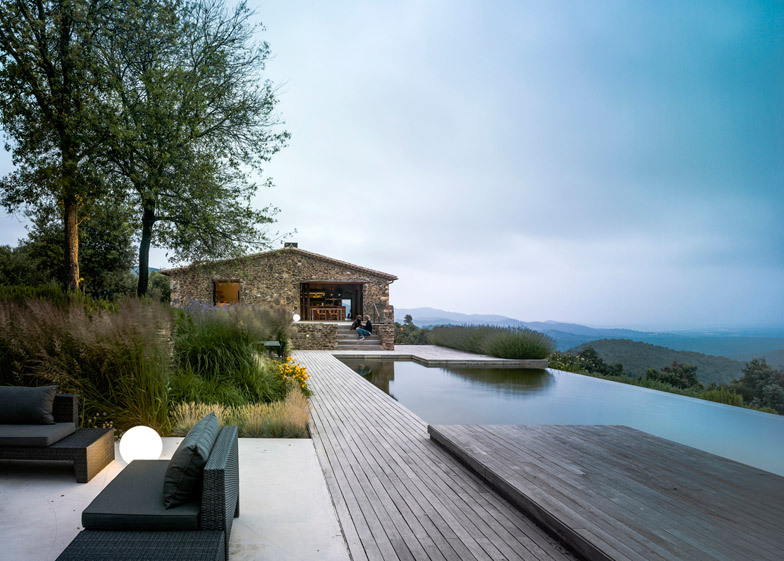 A large opening in the wall of the living room also leads out to a deck, which steps down to meet a swimming pool featuring a natural plant and gravel filtration system. Cork from the property's estate was used as insulation to supplement clay and straw panels set behind the stone walls to ensure they retain their natural breathability and insulating qualities. 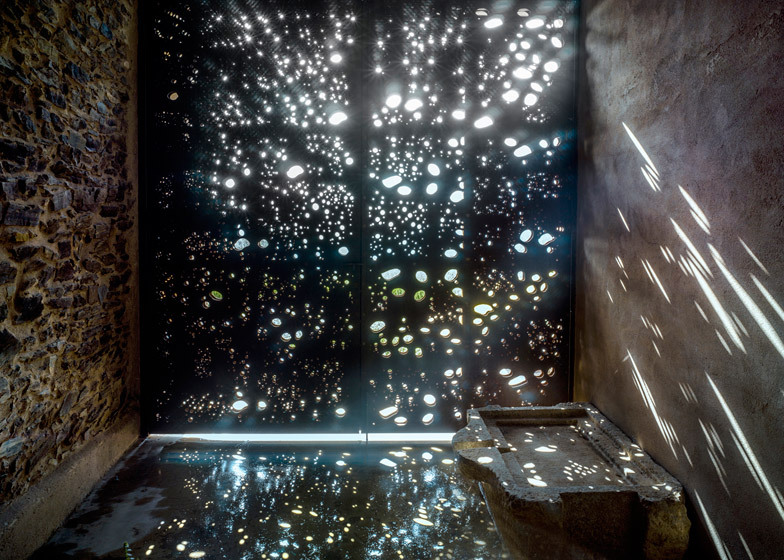 Glass balcony balustrades and walls with perforated patterns allow dappled light to shine through, enhancing the relationship between the interior and exterior spaces. 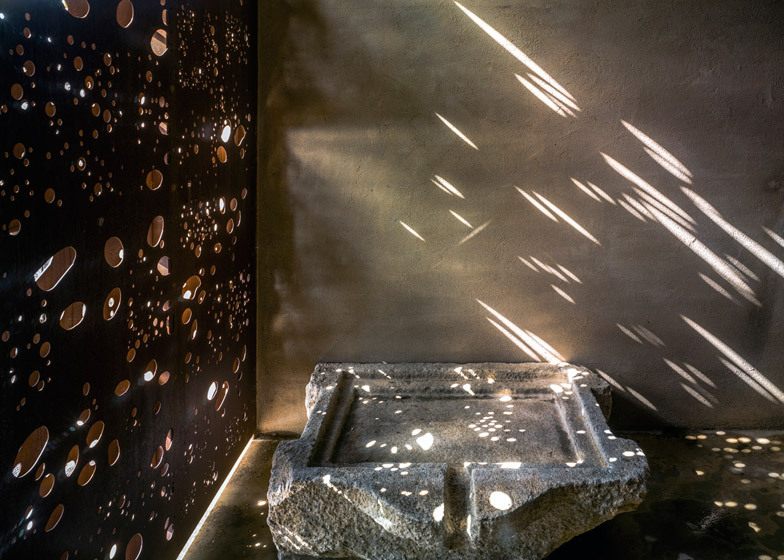 Aged steel also appears inside the house, where it is used for the staircase balustrade, while natural plaster covering the walls creates a textured surface that negates the need for paint. Zest Architecture is presenting Villa CP at the Venice Architecture Biennale as part of the Time Space Existence exhibition, taking place at Palazzo Bembo and Palazzo Mora. Photography is by Jesús Granada. ZEST Architecture's work is always marked by sustainability, so it may not come as a surprise that this project sports materials and elements such as a natural pool whose water is filtered by plants and gravel, insulation with locally harvested and produced cork, clay and stray panel finishes in the interior and heating / cooling through a geothermal installation.